Have you made a dent in your holiday shopping yet? If not, check out our curated Gift Guides to speed up the process! We’ve got all sorts of stylish + cool picks for all the special people in your life — your bestie/sister/aunt/girlfriend, or your guy… And some awesome pieces that won’t break the bank — all under $25! Today’s guide is specifically for the newlyweds! These finds are PERFECT if you’re attending a December/January wedding or just as a sweet little something to kick off the newlyweds’ holiday season! 1. Mrs. Travel Passport Holder — Before they head out on their happily ever after, gift your gal pal this adorable passport cover that celebrates her new ‘Mrs.’ status! 2. Custom Couple Print — How darling is this customizable print?! Have the artist recreate their wedding day outfits or for a more casual look – what they’re typically seen in. Oh, and the custom portrait is a digital file so you can print it out super easily at home! 3. Do You Want to Cuddle Candle — Is that even a question? Your newly-wedded friends are sure to have this candle burning all the time. 5. Let’s Get Lost print — Are your married pals super into adventure + discovering new places? Then they’ll love this “Let’s Get Lost” print! 6. Wifey Tee — Snag this adorable tee to celebrate your friend’s new title… And it makes for the perfect tee to wear during honeymoon travels! 7. His and Hers Luggage Tags — Every globe-trotting duo needs a set of adorable luggage tags! 8. Cinema Box LED Light — For a darling + minimalistic addition to any bedroom, let the newlyweds pick out sayings that inspire them and light up their life! 9. I Love You a Latte Mug – Coffee. Coffee. Coffee. And more coffee. This darling mug conveys all that you love — family, your spouse + lots of caffeine. 10. Marble Wine Copper Chiller — Keep the wine chilled and the glasses filled… Just because the wedding is over doesn’t mean the toasts + cheers need to stop! 11. Heart Collage — Can’t pick just one favorite photo of the couple? Create a unique + personalized keepsake with 30 pictures with this heart collage! 12. LOVE pillowcases — No newlywed bed is complete without these sweet “LOVE” pillowcases! So which pieces do you fancy? We’re pretty fond of them all! Check back on Saturday for our last Gift Guide of the week – we’ll be sharing the perfect gifts for the foodie in your life!! 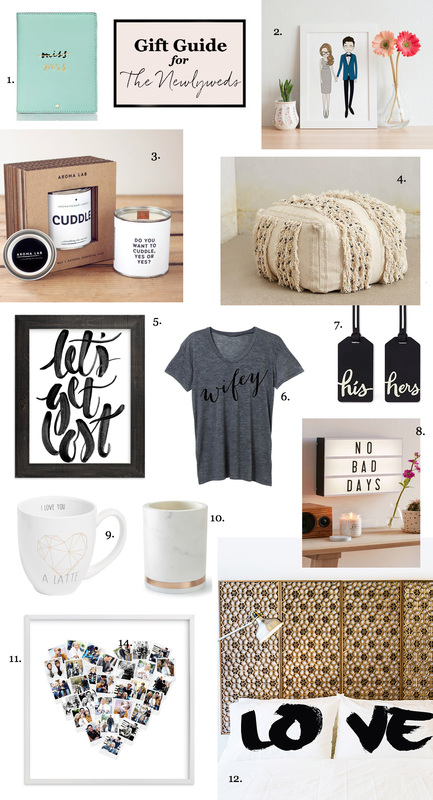 Gift Guide – All Under $25!